When considering townhouses in New York, one may think of the storied brownstones of the Upper West Side or the luxurious, ornate townhouses on the Upper East Side. But these iconic, old New York–style homes are located in some unexpected places as well. “Families, affluent buyers and creative buyers are finding unique and lovely homes in every nook and cranny of the city,” said Charles Homet, senior vice president and associate broker at Halstead Property. This influx of development may be due in part to townhouses that were parceled off into multiple family homes now being restored back to their original glory. According to Charles Ruoff, senior vice president and associate broker at Brown Harris Stevens Brooklyn, LLC, that borough has emerged as a top market for townhouse development—but supply is limited. Ruoff also sees an increase in development in the Brooklyn market to accommodate the pressing need for single-family living. As the prices of townhouses have risen in the downtown Brooklyn area, up-and-coming areas in other neighborhoods have emerged, including Clinton Hill, Windsor Terrace and Kensington, as well as Ditmas Park. Ruoff recalls two notable townhouses in Brooklyn he’s come across—the former home of Jennifer Connelly and Paul Bettany on the corner of Carroll Street and Prospect Park West in Park Slope, and the old Truman Capote house at 70 Willow Street in Brooklyn Heights. Capote’s old landing pad is currently on the market for $15.9 million. As far as price per square foot, downtown Brooklyn townhomes run at about $500 to $700 per square foot, compared to upward of $800 to $900 per square foot in the most popular neighborhoods. Eileen Robert, Corcoran senior vice president and director of townhouse sales, names Harlem and Brooklyn as top areas top to find off-the-beaten-path townhomes. But Robert remembers a Harlem townhouse that sticks out in her mind in terms of grandeur. But Lucie Holt, senior vice president and associate broker at Citi Habitats, said that in when it comes to Harlem townhouses, supply is tight. “Harlem was years ago a big development for townhouse development because there were so many shells available and going for low prices, but that has tightened up a bit,” she said. Cathy Taub, executive vice president and associate broker at Stribling and Associates, also names the uptown/Harlem area as a prime locale for these single-family gems. But Taub agrees with Ruoff in terms of Brooklyn being a major market as well. “Brooklyn has homes of many styles, depending on the neighborhood, as it is less densely populated and has far fewer high-rises,” she said. And don’t forget about East Village, the storied home of hipsters and, as it turns out, townhouses alike. “There are examples of lovely townhouses in the East Village. Of course, the village, both central and far west, is home to many fine and valuable townhouses, but I wouldn’t call that ‘off the beaten track,’” Taub said. Roger Erickson, senior managing director at Sotheby’s International Realty, also has seen townhouses in the village, including one that he just can’t seem to forget. Holt also names the village as a hot area for townhouses—albeit not as expensive as those on the Upper East Side. “The value of townhouses varies depending, of course, on where they are location-wise,” she said. While Robert can name many notable townhouses that sit on the Upper East Side, she also mentions the area “downtown 10th Street between University and Sixth, as well as the West Village name streets, Bank, Charles and Perry,” as sought after areas, and Brooklyn Heights, Montague Terrace and Columbia Heights. This just proves that townhouses can call other neighborhoods home. “The Upper East Side is just one of the many neighborhoods with sought-after townhouse inventory,” Taub said. “Houses between Fifth and Madison avenues are usually quite wide and extremely expensive. According to George van der Ploeg, senior vice president at Prudential Douglas Elliman Real Estate, when it comes to finding off the-beaten-path townhouses, one must simply travel downtown. However, increasingly popular loft-style apartments have nearly wiped out the existing inventory of townhouses in Tribeca. Louise Beit, senior vice president at Sotheby’s International Realty, agrees, noting downtown as an unexpected area ripe with townhomes. It seems that instead of moving to the suburbs upon the arrival of children, families are instead putting down roots in the city. 11 Leroy Street in Greenwich Village. 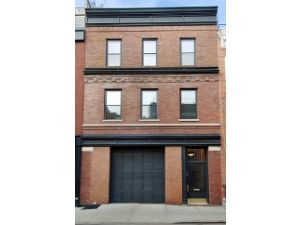 Listed by Corcoran agents Sara Gelbard (212-242-9941) and Paul Kolbusz (212-500-7026) at $9,950,000. 156 Lafayette Avenue in Fort Greene. 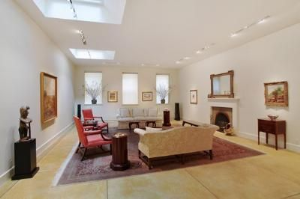 Listed by Corcoran agent Tatiana Cames (212-444-7833) at $1,950,000. 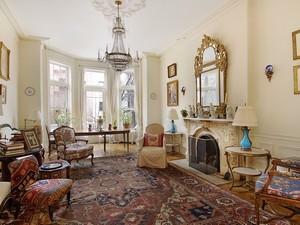 Living room at 281 Henry Street in Brooklyn Heights. 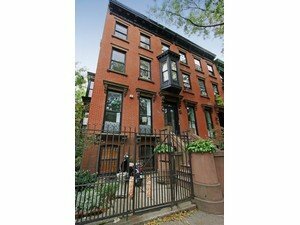 Listed by Corcoran agents Ellen Newman (718-923-8072) and Lisa Detwiler (718-923-8091) at $5,395,000. This website is not the official website of The Compass Group or its affiliated companies, and neither The Compass Group nor its affiliated companies in any way warrant the accuracy of any information contained herein. Any product and/or services offered for sale on this website shall not be considered an offer to sell such goods and/or services in any state other than New York.